What’s your triangle? * The above is from a map on which I was drawing the Downtown Mall, Belmont and what is “walking distance” to Downtown and UVA for some clients. I’ve found that many, if not most, of my clients have specific triangles – geofences of sorts – that guide their buying areas. The top squiggle in the box is 29 North. 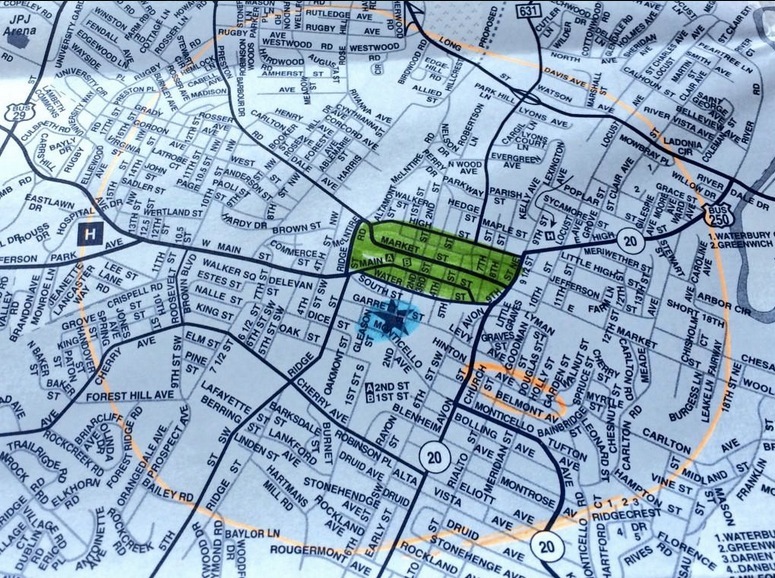 The circle in the center circle is the City of Charlottesville. The two points of the triangle to the West represent home and school. Typically, my clients’ lives (and my life too, when I’m playing dad/husband and not Realtor) lead them to at least three points on a daily basis, and determining these points is often challenging at best to do from afar, or quickly. – Which school will my kids attend? – Will there be redistricting? – At which grocery store will I shop? – Wegmans? Whole Foods? Kroger? Today, Google is tracking wherever your smartphone goes, and putting a neat red dot on a map to mark the occasion. You can find that map here. All you need to do is log in with the same account you use on your phone, and the record of everywhere you’ve been for the last day to month will erupt across your screen like chicken pox. So … if you’re moving to Charlottesville, take my advice to rent before you buy – turn on google’s location history and use them to better understand your triangles. And once we’ve figured out the triangles and have a foundational understanding of the Charlottesville real estate market, we devise a path forward. * From last month’s Monthly Note. I have to agree, great post. You are a great example of an agent who know their market. Knowing not only the needs and lifestyle of your clients and then creating a purchase neighborhood is a great example of going above and beyond. Thanks for the reminder.